My father in law Christopher and me about to tee off. I played horribly but we had a great time. My grandfather used to take his family to Carnoustie for their summer holidays. And of course he played while they were on the beach. I think they were probably ok with that. The picture opposite is me with my father in law Chris Grant, an excellent golfer and all round terrific guy. Carnoustie hosted the 147th Open in July 2018. While it would be fair to say that Molinari came in under the radar this week – inevitable, perhaps, with the likes of Jordan Spieth, Tiger Woods, Rory McIlroy and a plethora of Major champions in the field – a look at his form coming into the Championship would have revealed a player at the top of his game. He was not to be underestimated. In his previous five starts, Molinari had won twice and finished runner-up twice. Most telling was that he beat McIlroy down the stretch at the BMW PGA Championship at Wentworth in May and followed up with his first victory in America, where he finished eight strokes ahead of his nearest rival after a final round of 62 (yes, 62) at the Quicken Loans National. To watch Molinari up close is to see a player seemingly in complete control of his game. Seasoned observers have described him as a player “with all the components”, metronomic almost. He is unerringly straight off the tee, a fine iron player who is also blessed with a good short game. He also has a fabulous temperament, something which was needed in the final round to cope with the relative mayhem that goes with playing alongside Woods, his playing partner on the day. The 14-time Major champion may have taken the outright lead at one point, yet Molinari showed no sign that the excitement surrounding them was affecting him. Earlier this year, Molinari suggested he had to find a killer instinct. And so he has. Much of that is probably down to the work he has done with Dave Alred, the performance coach, who first became known for his work with Jonny Wilkinson, the England rugby union player, and then golf’s Luke Donald, who subsequently climbed to No1 in the world. Alred’s influence is evident in the way Molinari sets his targets. It almost certainly explains how he managed to play the last two rounds at Carnoustie without dropping a shot. In fact, he was the only player in the field on the final day to have a bogey-free round, one of 69 that followed a third round of 65. His eight-under-par total of 276 brought him victory by two strokes over four others – Justin Rose, Kevin Kisner, McIlroy and Schauffele. Such focus came into play at the 7th, 12th and 13th holes, when he holed clutch putts to save par. And it came to the fore at the 72nd hole with a fearless drive on the most fearsome of holes and an arrow-like shot from 115 yards to within four feet of the hole for his second birdie of the day. On eight under par he had set a clubhouse target that only America’s Xander Schauffele could match. It was not to be. Molinari was sitting watching in the scorers’ hut when Schauffele missed a putt for par at the 17th that brought an end to his challenge. As is typical of the man, he did not show delight at a fellow competitor’s misfortune, but instead headed to the putting green to gather his thoughts. Such is the Champion Golfer of 2018. Pure class. 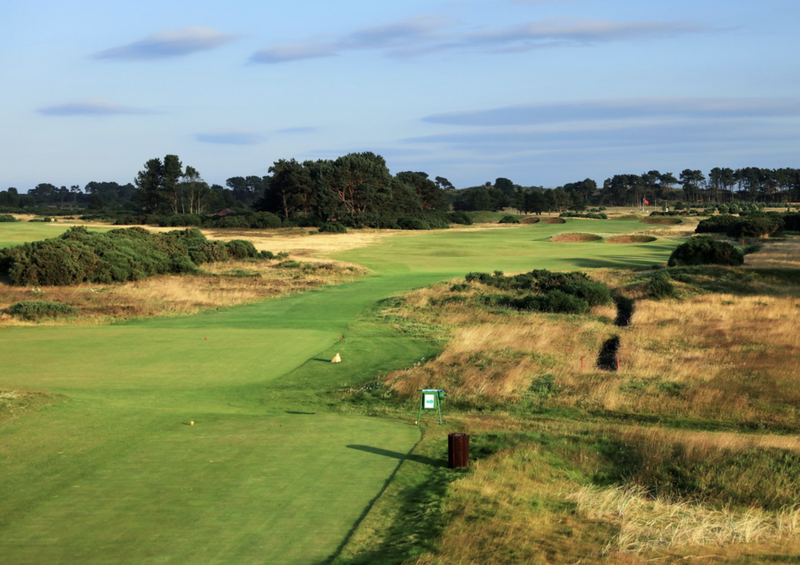 The game of golf has been played in Carnoustie for well over four centuries. The first indication that the game was being played in the Angus town can be found in the Parish Records of 1560 when the game of gowff was mentioned and there is every indication that the game has played an important part in the town’s life ever since. Unfortunately, nobody knows how proficient Maule was at “gawf” or, for that matter, “leicherie”. As with so many of the older Scottish golf towns, the history of Carnoustie is not well recorded. We do not know the exact site where Maule and his colleagues “exercisit the gowf” in the 15th century but we do know that by 1839 the Carnoustie Golf Club had been formed, making it the oldest artisan club in the world. Around that time, the Carnoustie course consisted of 10 holes, laid out by Allan Robertson, the greatest golfer of his time and the man generally acknowledged to be the first golf professional. Later, in 1867, Tom Morris Snr extended the course to 18 holes but it was not until 1926, when the great James Braid was brought in to oversee sweeping changes, that the course became ready to receive the Open Championship. Since then, Carnoustie’s Championship course has become regarded as one of Britain’s finest, and most challenging, tests of golf. Occasionally, from time to time, the course was allowed to deteriorate but, under the watchful eye of now retired links Superintendent, John Philp, it has been restored and is now, not just a formidable challenge, but also one of the best-conditioned courses in the country as well. I can't forget Padraigh Harrington's shot in to the 18th to seal his win. We all thought he had skulled it but of course it checked up perfectly. And who can ever forget a certain Jean Van Der Veld's shocking decision making on 18 to lose The Open? The 1999 Championship, Carnoustie’s first since 1975, featured a climax so extraordinary, so unexpected, that it will never be forgotten. It resulted in Lawrie becoming the first Scotsman to win the Open on native soil for 68 years but also made Frenchman, Van de Velde, headline news all over the world. The records show that Lawrie, the first qualifier to win the Open since the R & A started to give exemptions in 1963, won the title after recording rounds of 73,74.76,67 and then beating Van de Velde and former champion, Justin Leonard, in a subsequent four hole play-off. However, what the bare facts don’t explain are the incredible scenes witnessed on the 72nd hole. To set the scene, Lawrie, then ranked 159th on the official World Rankings, had started the final round ten shots out of the lead. Despite a fine four under par 67, he was still three shots behind Van de Velde as the Frenchman mounted the last tee but, sensing something might happen, continued to practise his putting as a worldwide audience measured in millions watched in amazement as Van de Velde proceeded to implode. Lawrie deserves huge credit for the manner in which he played, both during the last round and in the resultant play-off but, in the end, he still could not have prevailed had it not been for Van de Velde perpetrating one of the biggest collapses in sporting history. Needing only a double bogey six on the final hole to become the first Frenchman to win the Open for 92 years, Van de Velde ran up a catastrophic triple bogey seven, even having to hole a brave 10-foot putt to get into the play-off. What transpired left the eloquent BBC golf commentator, Peter Alliss, almost lost for words. The Frenchman hit his drive right off the tee, finding dry land, albeit on a peninsula guarding the Barry Burn. From there, he could have hit wedge, wedge onto the green but, instead, elected to go for the green in two. Sadly for him, his second shot did not come off as he had envisaged. Instead, it hit the upper tier of a grandstand and rebounded into the deep rough. That was the start of Van de Velde’s problems. Next, the horrified gallery watched as his third shot came out softly and went into the burn in front of the green. After that, the episode became almost surreal. To begin with, the Frenchman chose to take off his shoes and roll up his trouser legs before jumping into the water to see if he could hit his submerged ball. Finally, as the water lapped around his ankles, sense prevailed. Van de Velde took a drop in the rough but then hit his fifth shot into the bunker guarding the right of the green. Under the circumstances, he displayed exemplary fortitude to blast his sixth shot out to ten feet and then hole the resultant putt. Click here to watch the 18th unfold. Sadly, though, Van de Velde’s chance to win the Claret Jug had gone. On the first play-off hole, clearly still in torment over what had happened ten minutes earlier, he hit his tee shot into a gorse bush leaving Lawrie and Leonard, the 1997 champion, to battle it out. In the end it was the unheralded Scotsman who prevailed. He moved into the lead when he holed a 12-foot birdie on the 17th, the third play-off hole, and then sealed his first major title when he hit his second shot to three feet for another birdie on the 18th. The famous hotel at the 18th green.